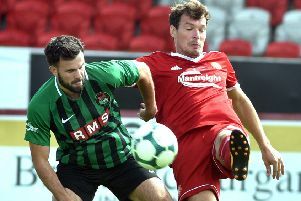 Gregg Harrison (right) during his time at Annagh United. Former Loughgall and Annagh United striker Gregg Harrison stepped out at Windsor Park recently to help showcase Northern Ireland’s EURO 2016 home kit. Harrison - along with fellow Northern Ireland supporter Stuart Campbell from Bleary - joined Northern Ireland legend David Healy on the international field as part of a JD Sports promotion. Keith Gillespie, another former Northern Ireland favourite, was also on hand for the sneak preview. The JD Sports video was staged to publicise the release of the kit, with Moneyslane striker Harrison tucking away a penalty kick and heading home a cross.